Secretary of State Rex Tillerson speaks at a news conference at the State Department in Washington, Tuesday, March 13, 2018. President Donald Trump fired Tillerson and said he would nominate CIA Director Mike Pompeo to replace him, in a major staff reshuffle just as Trump dives into high-stakes talks with North Korea. 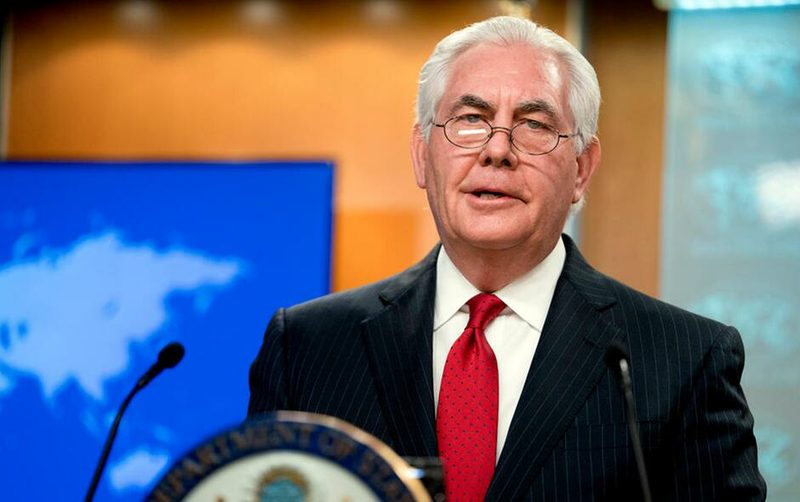 WASHINGTON (AP) — Although Rex Tillerson spent just over a year as America's chief diplomat, he'll continue to benefit from an arrangement he crafted with his former employer, energy giant Exxon Mobil, that could generate millions of dollars in tax savings. Tillerson, who was Exxon's chief executive officer when President Donald Trump selected him to be his secretary of state, worked out a $180 million retirement package with the company that also met the U.S. government's conflict of interest requirements. The arrangement won't be affected by Trump's decision to fire Tillerson, which the president announced on Tuesday. "He got a sweetheart deal from Exxon," said Steve Rosenthal, a senior fellow at the Urban-Brookings Tax Policy Center, who added that the arrangement remains unaffected by Tillerson's ouster. The arrangement could be upended if Tillerson goes to work for an Exxon competitor. The Exxon deal included a forfeiture clause that barred Tillerson from being employed elsewhere in the oil and gas industry during the 10-year period. If he violated the terms of the clause, the money from the trust would be distributed to one or more charities. Gary Cohn, who departed last week as Trump's top economic adviser, also took advantage of the tax deferral. Cohn, who left a top position at Goldman Sachs to join Trump, sold shares from the Industrial and Commercial Bank of China and Goldman Sachs, without immediately paying taxes on the capital gains. Democratic Sens. Ron Wyden or Oregon, Tom Carper of Delaware and Sherrod Brown of Ohio said in February 2017 the clause relied on Tillerson's own certification that he was complying with it. "Therefore, it appears that the non-compete clause does not truly create a substantial risk of forfeiture and Mr. Tillerson should pay taxes currently on the full amount in the trust," they wrote. But Paul Gutterman, director of the master of business taxation program at the University of Minnesota, said Tillerson won't make out as well as many seem to believe. "Benefit is in the eye of the beholder," Gutterman said. If Tillerson had stayed at Exxon, he wouldn't have paid taxes or if he had just held onto his vested shares after retiring without entering government service he would have deferred taxes as well, according to Gutterman. "Meanwhile, it is unlikely that he will keep it in funds drawing very low interest, so as soon as he moves those funds the deferral will be lost," he said. "Depending on how much he would have left in Exxon stock one could argue he comes out behind."